Department of Radiology, All India Institute of Medical Sciences, New Delhi, India–110029. *Address correspondence and reprints request to: Arun Kumar Gupta, Department of Radiology, All India Institute of Medical Sciences, New Delhi, India–110029. Gupta P, Gupta AK, Aggarwala S. Urinary Ascites Secondary to Bladder Perforation in a Neonate with Posterior Urethral Valves. Oman Med J 2013 Jul; 28(4). Neonatal urinary ascites is a rare condition. It can be spontaneous or iatrogenic. Posterior urethral valve is the most common cause of spontaneous urinary ascites. It occurs most commonly from the rupture of calyceal fornices secondary to raised intrarenal pressure. Rarely, urinary bladder perforation is responsible for urinary ascites in Posterior urethral valve. Urinary ascites should be considered in a neonate with ascites with unexplained renal failure. 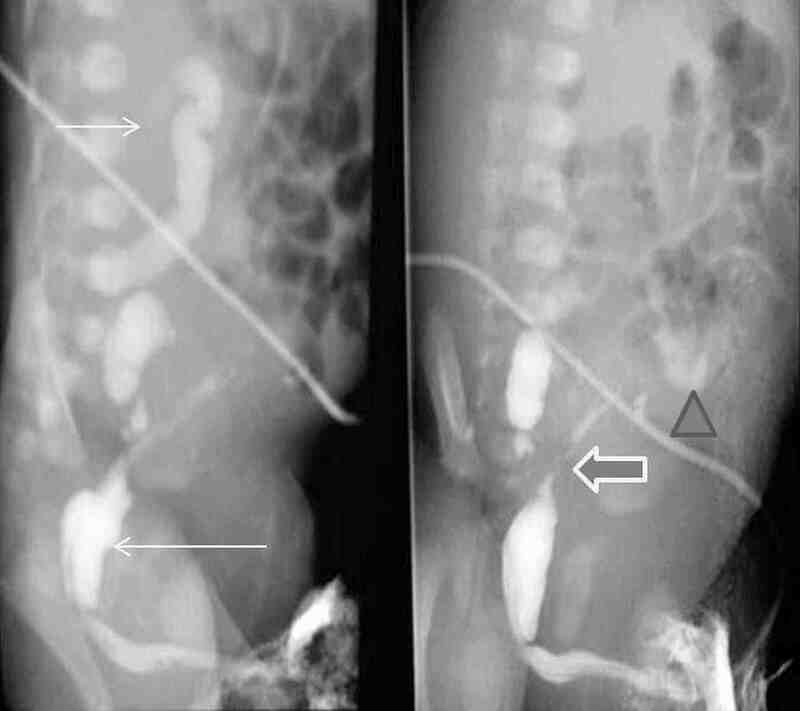 In this article, we present the imaging feature and brief review of literature of a child with urinary ascites secondary to Posterior urethral valve. Keywords: Urinary ascites; Posterior urethral valve; Bladder perforation. Spontaneous bladder perforation is a rare entity in a neonate and occurs secondary to obstructive uropathy, most commonly Posterior urethral valve (PUV). Other predisposing conditions include congenital bladder diverticulum, neurogenic bladder, pelvic masses, hypoxia and morphine administration. Clinical presentation includes history of failure to micturate or dribbling with abdominal distension and uremia. Diagnosis is suspected on the basis of ascites with deranged renal functions and is confirmed by imaging. Ultrasound helps to establish the presence of ascites and dilatation of the upper tracts with or without associated urinomas and cystic dysplasia of the kidneys. Voiding cystourethrography (VCUG) helps to establish the leak at the level of the urinary bladder by contrast extravasation into the peritoneal cavity and provides information about the underlying disease with associated changes in the urinary tracts. Neonatal urinary ascites is a life-threatening condition as the peritoneal membrane "autodialyzes" the urine, leading to progressive increase in the blood urea nitrogen (BUN) and derangement of the serum elecrolytes. Management consists of catheter drainage or surgery depending on the condition of the neonate, with the primary aim of diversion of urine from the peritoneal cavity. Prognosis depends on early diagnosis and adequate urinary drainage. A five-day-old male, born as a full term, by uncomplicated vaginal delivery in a hospital was referred to the pediatric emergency at our institute for retention of urine and progressive distension of the abdomen since birth. He had never passed urine in stream and there was no history of instrumentation. On review of the patient’s records, antenatal ultrasonography (USG) revealed bilateral hydroureteronephrosis and USG done on the first day of life had revealed ascites in addition to hydroureteronephrosis. His serum urea and creatinine levels were found to be 109 and 2.8 mg/dL, respectively. USG done at our hospital showed ascites with bilateral hydroureteronephrosis and thick-walled small capacity urinary bladder (Fig. 1). Urethral catheterization was done and external drainage of urine was achieved. A provisional diagnosis of PUV with bladder perforation was made and the patient was referred for voiding cystourethrography (VCUG) to demonstrate the leak. 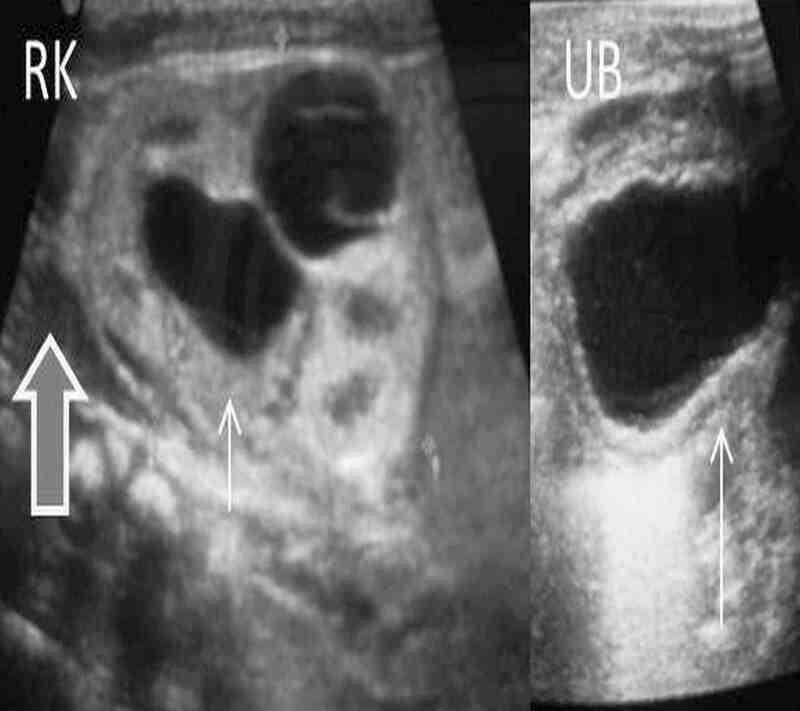 Figure 1: Axial USG images at the level of urinary bladder and bilateral kidneys show thick walled contracted bladder (large arrow) and bilateral hydronephrosis (small arrows) with free fluid in the hepatorenal pouch (thick arrow). VCUG showed dilated posterior urethra with contracted bladder with right vesicoureteric reflux and extravasation of contrast into the peritoneal cavity (Fig. 2). Intraoperatively, 30-40 ml of urine was drained from the peritoneal cavity. The urinary bladder was found to be thick walled; however, no site of perforation could be demonstrated on the bladder. Blockson’s vesicostomy wasalso done. Postoperatively, vesicostomy did not function well. Serum creatinine dropped to 2.2 mg% but remained at that level. As hydronephrosis worsened, right percutaneous nephrostomy was done, which was followed 12 days later by bilateral loop ureterostomies. The baby had diuresis which recovered over a period of two weeks. Serum creatinine dropped to 0.5 mg% and the baby was discharged after 20 days of care in neonatal intensive care unit. Figure 2: VCUG images show markedly contracted irregular bladder (long arrow) with right vesicoureteric reflux (short arrow) and tortuous right ureter with extravasation (thick arrow) and pooling of contrast into the peritoneal cavity (triangle). Urinary bladder perforation, leading to urinary ascites is a rare complication of PUV.1 Other more common causes of urinary ascites in PUV include rupture of calyceal fornices or transudation across the intact upper urinary tracts. In obstructive uropathy, the upper tracts are subjected to high pressures in the intrauterine life. This affects the development of the kidneys and cystic renal dysplasia ensues. However, protective mechanisms do exist to prevent this irreversible damage to the kidneys. These protective mechanisms include vesicoureteral reflux, bladder diverticuli and urine extravasation.2 Extravasation at the level of the fornices may result in urinoma formation around the kidneys, which may remain contained or communicate freely with the peritoneal cavity, leading to urinary ascites. USG is the first choice investigation as it clearly demonstrates the changes in the urinary tract and confirms ascites. Findings on USG include hydroureteronephrosis, urinomas, ascites, changes in bladder in the form of thickening of the bladder wall, diverticuli, and dilated posterior urethra. Management has to be prompt with the basic aim of achieving decompression of the urinary tract. This may be accomplished by abdominal paracentesis, catheter drainage, or surgical exploration and repair of the bladder wall. Indications of abdominal paracentesis include respiratory distress and sepsis.5,6 Catheter drainage by urethral route with or without vesicostomy achieves healing in most patients in 10-14 days, following which the fulguration of the PUV is attempted. Catheter drainage fails in ruptures with large rents and continued leak, loculated ascites, and inadequate decompression of the upper tracts. These patients require surgical exploration, as in our patient, and repair of the defect. However, in our case, no defect could be identified in the bladder wall on surgical exploration, probably because of the marked hypertrophy of the bladder wall. A higher diversion in the form of bilateral loop ureterostomies could stabilize the patient. Prognosis depends on the age at diagnosis and the extent of changes in the urinary tract. 2. Rittenberg MH, Hulbert WC, Snyder HM III, Duckett JW. Protective factors in posterior urethral valves. J Urol 1988 Nov;140(5):993-996. 3. Morrell P, Coulthard MG, Hey EN. Neonatal urinary ascites. Arch Dis Child 1985 Jul;60(7):676-678. 4. Macpherson RI, Leithiser RE, Gordon L, Turner WR. Posterior urethral valves: an update and review. Radiographics 1986 Sep;6(5):753-791. 6. Trulock TS, Finnerty DP, Woodard JR. Neonatal bladder rupture: case report and review of literature. J Urol 1985 Feb;133(2):271-273.